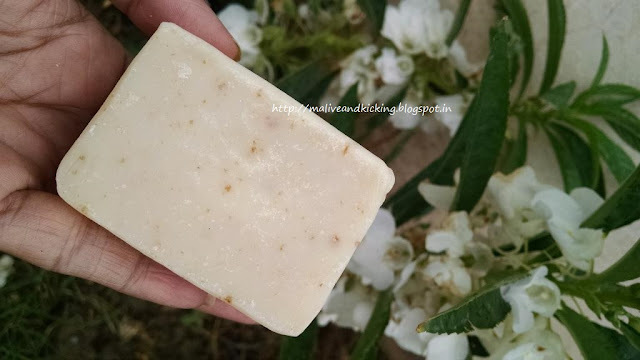 Knowing about my obsession for organic soaps?? I love using them soo much. 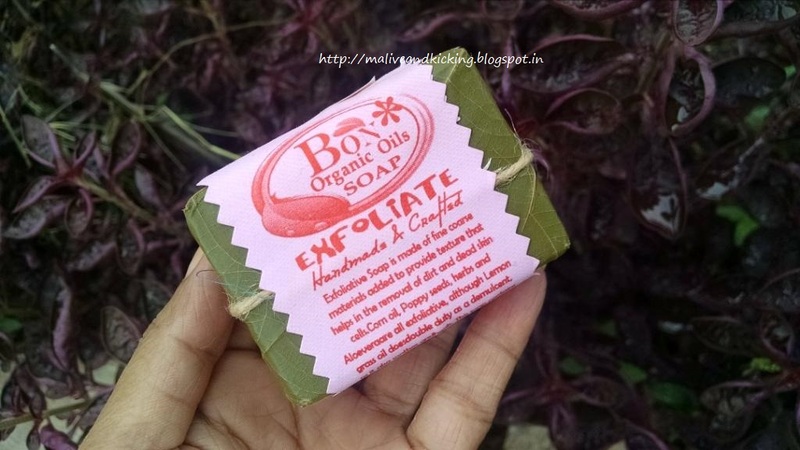 Today I am reviewing an exfoliating soap which is from the house of Bon Organic. 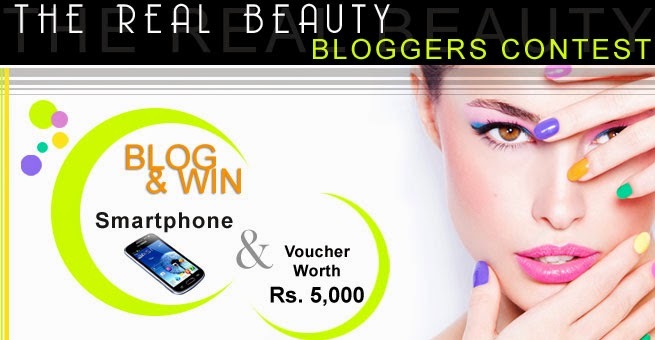 This is the first ever product I used from their exclusive and excellent product range, & I am already in love with it. 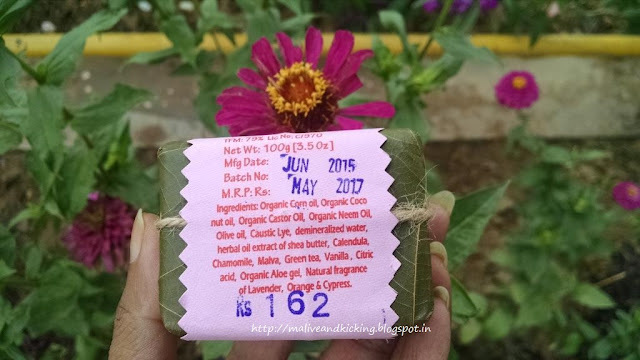 Do read in details how I felt about it..
At BON, we are inspired by the nature’s secrets towards longevity and healing properties riddled in its precious oils, fragrant flowers, gentle healing herbs, flavored spices and other valuable botanicals. We propel to deliver this organic experience of ‘true nature’ to you as we have recognized that these wonders of aromatherapy will render tranquility and good health to the body, mind, and soul.Our team strives to consistently create, offer, and convey an incomparable lifestyle through a range of body, bath, home, and accessorial products exclusively organic and handcrafted. Yes, this is not just a range of personal care products on the shelf, but a conscious way of living, an archaic way of life for everyone. BON’s Exfoliate soap is made of fine coarse materials that are added to provide the texture that will facilitate the removal of dirt and dead skin cells. The present Corn oil, Poppy seeds, Herbs, and Aloe Vera are the main exfoliates while the Lemongrass oil works on double duty as the demulcent to ensure the soap soothes and heals the skin. This soap contains extra ground herbs for a scrubby effect and is not scented or colored. 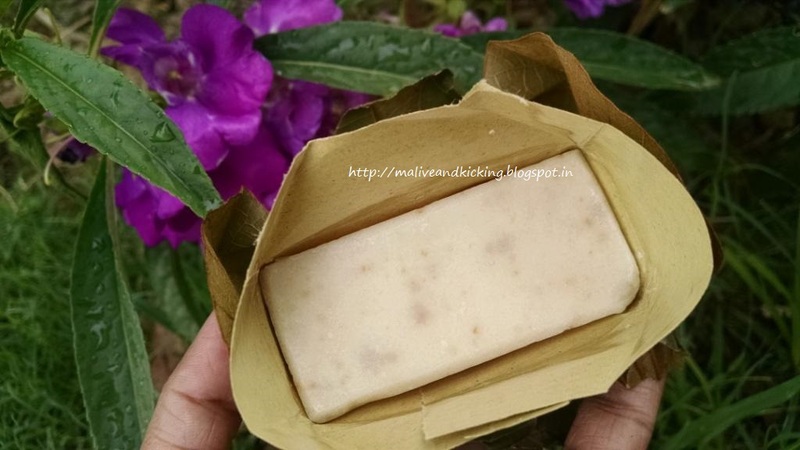 The soap is very carefully infused with certified ingredents namely Saponified Organic corn oil (zea mays), Organic Coconut oil (Cocosn Nucifera), Castor Oil (Ricinus Communis), Organic Neem oil (Melia Azadirachta),Olive oil (Olive (Olea Europaea), Demineralised water, Shea butter (Butyrospermum Parkii), Calendula oil [Calendula officinalis], Essential oil of chamomile [anthem isnobilis], malva [Malva Sylvestris], organic lemon (Citrus Medica Limonum), Organic Aloevera (Aloe Barbadensis), lemon peel [Citrus Medica Limonum], Orange Peel [Citrus sinensis], & Natural preservative salinatural TCLS – based on Turmeric Oil, Clove Bud Oil, Lemon Grass Oil and Sesame Oil. 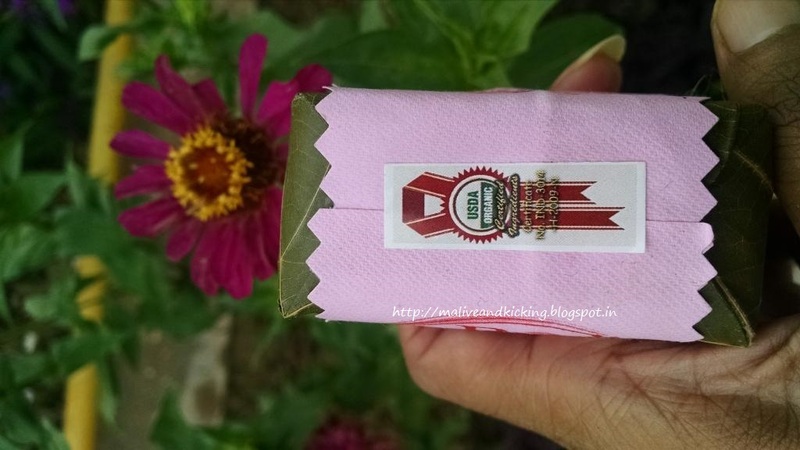 You may find the label of certification on the soap that speaks of its authenticity. Price: Rs.162 for each bar of 100 gm. 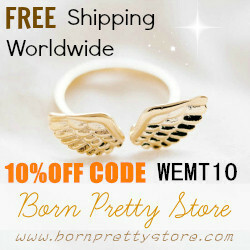 Online Order Here. The Bon Organic Exfoliate Soap is till date the best packaged soap bar I have ever come across. I can't stop admiring the eco-friendly packaging by the brand. The soap comes packed in multiple layers. 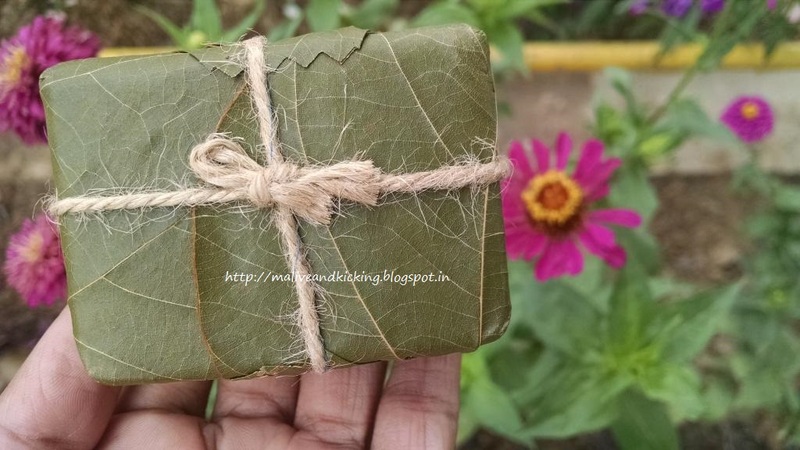 The outer most layer is a handmade sheet in pink color on which all necessary information is printed which holds soap bar beautifully wrapped in a dried leaf and tied with a natural jute string. I felt so wow to see this and opened it curiously to see the soap bar. But then there is another layer of recycled paper in which the soap bar is wrapped. 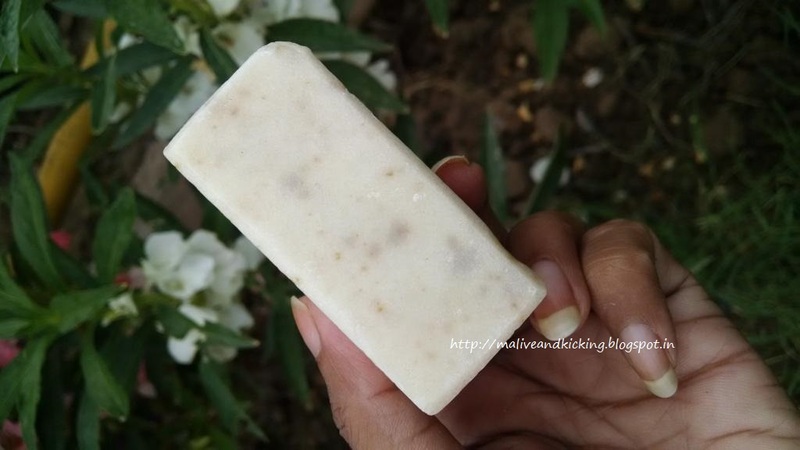 The soap is pearly white in color that shows brown spots on it which are actually exfoliating grains embedded in the soap. The soap is smooth on the surface and the grains do not feel before you start using it. The soap size is quite easy to make a grip than those huge soap bars and I am more comfortable to glide it on the body because of this reason. During the initial usage, the coarse grains don't touch the skin much. The soap lathers quite rich n creamy. I gently rub the skin to rinse it off properly so that there is no sticky feel left behind. In the subsequent usage of this soap, the grains started highlighting themselves on the surface and felt abrasive on skin without causing any rashes or feel scratchy. I didn't use loofah, but directly rubbed the soap on my skin very softly to let the coarse grains do their job nicely in contact with skin. I am super impressed with the results. The soap works wonder to remove the dead skin from harder skin as well including the joints like elbows, ankles etc. The skin feels absolutely bright & polished after getting exfoliated. I have used the soap on entire body, but could not dare to scrub on face. The soap has mild fragrance which stays only for the moment. I am perfectly all right even if it doesn't last for hours. There is a rich content of organic oils used in its formulation so even my dry skin felt very smooth and moisturized post shower. Coarse grains don't scratch the skin. Mild fragrance of essential oils. Works amazing on hard skin. Labels: bath n body, bathing bar, Bon Organic, essential oils., Exfoliate Soap, Natural, review, Review. 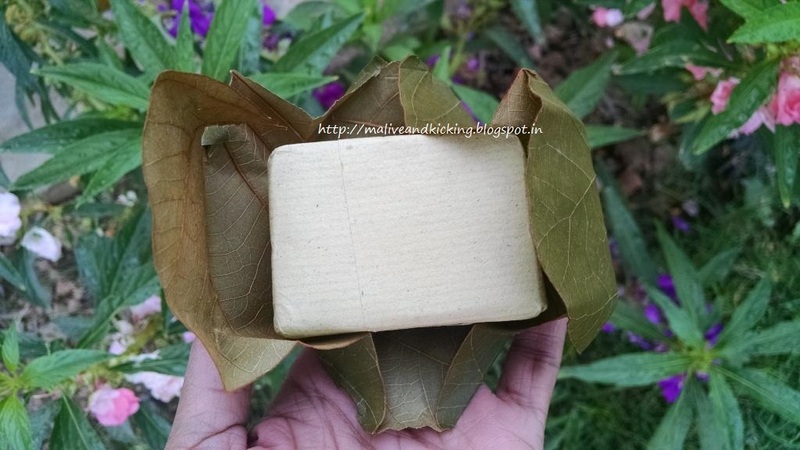 packing is awesome....handmade soaps are pure love, liked your review. Very true. Glad you liked it. Nice review!!! specially loved the packaging!!! 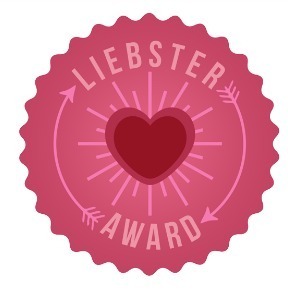 lovely review- wil; try it out- any idea of this company's FB page ? The FB page is linked in the first paragraph Jayanthi. Its worth the price Jaya. A must try. 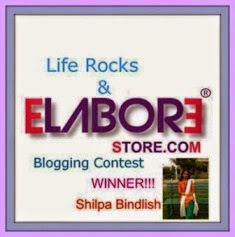 Nice review Shilpa :) Is it available in local market? 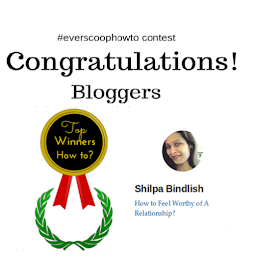 Thanks Anjali. I don't think you may find it in local stores.